I provide this service with no guarantees, every effort has been made to ensure that the information is correct but you perform this entirely at your own risk, I accept no responsibility for any loss direct or otherwise. 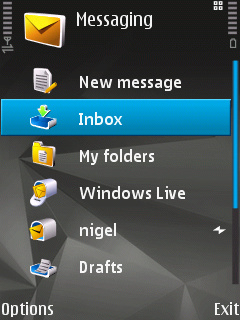 Users of Nokia S60, Symbian devices have a bit of a dilemma when trying to access hotmail. For some reason the wap version can be a bit hit and miss but people with standard accounts can't access hotmail through their phones mail client because they don't have access to POP3 or IMAP4. 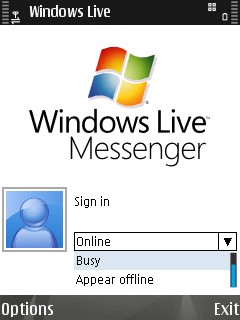 Helpfully Nokia and Microsoft got together and wrote the windows live application for series 60 devices supporting MSN Messenger and Hotmail. At the time of writing this application is compatible with Nokia: 5700 Music Express, 6110 Navigator, 6120c, E51, E61i, E65, E90, N73 (firmware v3.0638.0.01 or above,) N76, N80, N81, N82, N93i, N95 and the N95 8GB. 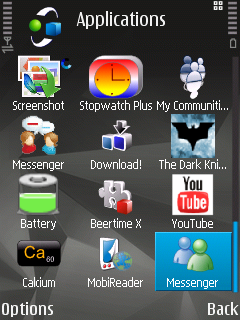 I'd expect it to work with all new symbian devices such as the N96 etc. People browsing from their phone can install directly to their phone from their browser by first clicking on the dep file then on the windows live file below. The picture on the left shows the newly added application in the applications folder where you can also switch between messenger, spaces search etc. 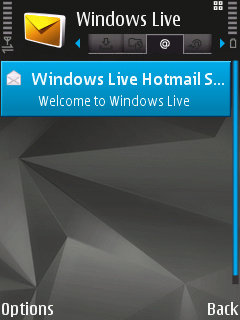 It's also worth mentioning that they have managed to integrate your phone and hotmail contacts together quite nicely.